This new publication covers all aspects of pretrial civil procedure in Washington superior courts and incorporates Washington statutes, rules, cases, and as appropriate, local procedures and forms. 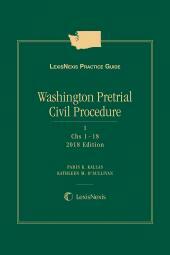 This publication provides practical, step-by-step guidance on all phases of pretrial civil procedure in Washington state superior courts for all attorneys engaged in civil litigation. • Practice guidance and tips from Washington practitioners -- user benefits from "real world" practical experience, tailored specifically to practice in the Washington state courts. • Coverage of local superior court rules -- many of the practical details of pretrial procedure are governed by local rules that vary from county to county; user is alerted to potential local variations in practice at every step. • Dozens of forms, including complaints, answers, motions, orders, and declarations -- saves hours of drafting time. • All type of motions. • Practice issues surrounding Rule 11 sanctions. • Detailed form contents, adhering to CR and GR requirements. 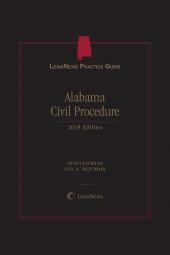 • Affidavit of prejudice and other commonly used forms. LexisNexis Practice Guide: Washington Pretrial Civil Procedure was created under the guidance of Editorial Consultants Judge Paris Kallas (King County Superior Court, retired) of Judicial Dispute Resolution LLC, and Katie O'Sullivan, partner in the Seattle office of Perkins Coie LLP, providing the benefit of years of practical experience with civil litigation in the Washington state courts. 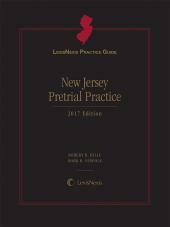 Additional Washington practitioners reviewed individual chapters and provided practice tips and guidance. Judge Paris K. Kallas (Ret.) serves as a mediator and arbitrator at Judicial Dispute Resolution, LLC in Seattle, Washington. She handles the full range of civil cases, including business disputes, personal injury, medical malpractice, maritime matters, insurance disputes, condemnation actions, and marital dissolutions. She also serves as a Discovery Master in complex civil litigation. Before joining Judicial Dispute Resolution, Judge Kallas served as a trial judge on the King County Superior Court. She was appointed by the Governor in May 2001 and served until July 2010. During her time on the bench, she served as Chief Civil and Chief Asbestos Judge. 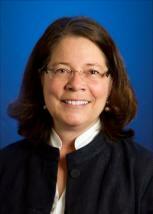 From 1996-2001, she served as a Commissioner of Division I of the Washington State Court of Appeals. Judge Kallas frequently speaks at Continuing Legal Education Seminars on topics including best practices in mediation and arbitration and civil trial practice. She also sits on the WSBA ADR Executive Committee and serves on the Board of the Dispute Resolution Center of King County. She graduated from University of Puget Sound School of Law (now Seattle University School of Law) in 1981. While practicing law, she specialized in appellate practice, criminal defense, and general tort litigation.